David Daniels is a true Memphis Bluesman with a clear understanding of what Blues music really is. 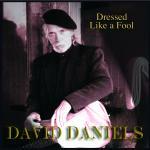 I've know David Daniels since he was 19 yrs old. He's always listening, practicing, or writing about true -life experiences, and that’s what the Blues is all about. He knows a good song will relate to regular people like you and I. Now, this is not to discard his guitar-playing, because this man can play the guitar. Did I mention he plays upside-down and left-handed? Yes, that’s what I said. Many poor guitar players’ first guitars were right-handed, and they turned them upside-down to learn their instrument. Most of them weren't trying to be like Jimi Hendrix; it was just what they had to learn on. This album is a long-awaited project that we all believed in, and I55 Productions came to the rescue for many of us in Memphis, TN. They realized that there is and always will be some of the best raw talent on this planet in this historical place called the Delta. All of the songs on this CD are heartfelt and you won't be satisfied to listen to just one; you’ll want to hear more and more.